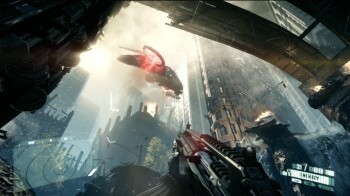 Crytek's goal was to bring a PC game to consoles, says Crysis 2's executive producer. Crysis 2 might have taken the series multi-platform, but Crytek's Nathan Camarillo says the studio hasn't "consolified" it for the new audience on the Xbox 360 and PS3. Camarillo says that Crysis 2 is a PC game made to fit on a console, not the other way round. Speaking in a video interview with Games.On.Net, Camarillo said that Crytek wanted to bring a Crysis-like gameplay experience to consoles - something he thought that it lacked - and that fundamentally meant that the PC had to be the primary platform. That goal, he said, was one of the motivating factors behind the creation of CryEngine 3. He said that Crytek had torn apart the engine that the first Crysis had run on, and rebuilt it so that it could scale more easily on consoles. This new engine also meant that PC users could get the best out of their hardware. Players with a low-end PC could still enjoy the game - something that couldn't be said about the first Crysis - but those with the really powerful computers could turn everything up to maximum and see the fruits of their investment. This is obviously good news for PC gamers, especially those who feel like they're being sidelined by the larger console demographic. Crysis 2 is already out in North America, and comes out for PC, PS3 and Xbox 360 tomorrow in Europe and Australia.